These words were recently used, as we are dealing with a major health crisis in our family. But I don't think we recognize the gravity of these words and the peace they can impart. And then as life so often goes this lesson was brought home to me in its own small way. My brain has been consumed by a decision I recently made. Was it the right decision? Can I correct it? Will I have to grovel to make the change? Well after a restful night of sleep I woke up ready to deal with it but I was still anxious. I said a quick pray and made some phone calls. But at this point nothing was finalized - and then the words came to me, "It's in God's hands." At that moment I realized that my worrying wasn't going to change the situation, my anxiety wouldn't fix it. Outside of what I could do, no additional worry, thought or anxiety on my part would affect the outcome. Did this mean that the outcome would be what I wanted? No; it simply meant that I was relieved from worrying about the outcome. It allowed me to think clearly and say if the outcome went one way- great, if not this is where we are. Lack of anxiety and worry allowed me to think clearly. The situation we are dealing with as a family is grave, but the principle is still the same. 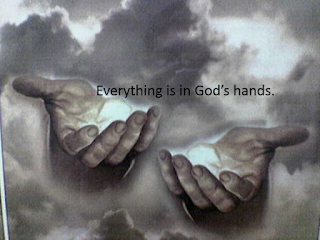 When it's in God's hands, no amount of thinking, bickering, worrying or anxious thoughts will alter the outcome. We just don't have that power. Obviously, not worrying doesn't mean not caring. It simply means after you've done what you can, let it go. God cares for us and in His caring, we can trust Him to help us. We can truly know all things - big and small, are in his hands. The next time you're stressed, worried or anxious, remember it's all in God's hands. 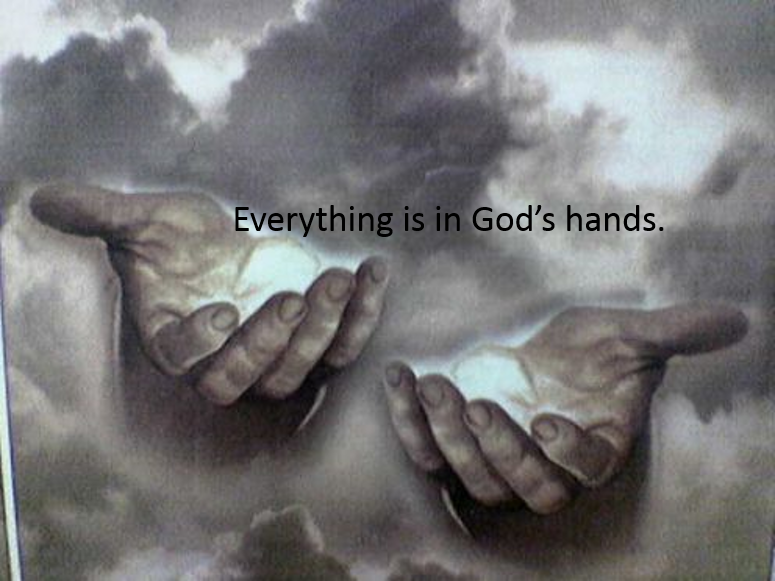 Everything is always in God's hands. Interesting how we are inclined to react with dread when it is apparent that we can't change a situation. What a revelation that everything is always in the hands of the Father of Lights who knows only how to give good gifts and has showered us with grace!